These were people who stuck out in there own special way and were known of by the general populous of Newburyport for a specific extraordinary reason. – 19 Oct 1919 – Sep 1980. Town Drunk. In the 70’d this was a perfectly acceptable title. 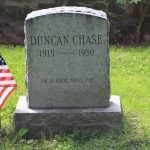 It may seem harsh in todays society to some, although Duncan seemed like he was the life of the party, even when there was no party to be had anywhere. You would always hear him say, “I’m a cool cool cat.” Then after that he would belt out a loud meow as he breathed in. He is buried at the Old Hill Burial Ground. His gravestone actually tells you he’s a cool cat! Ironically he looked like actor Foster Brooks. Larry Howard– The Town Weeper. A frequent addition to any wake and funeral in town. You would think Larry showed up at funerals of people he didn’t know. Larry was seen all over town, so he probably knew everyone anyway. 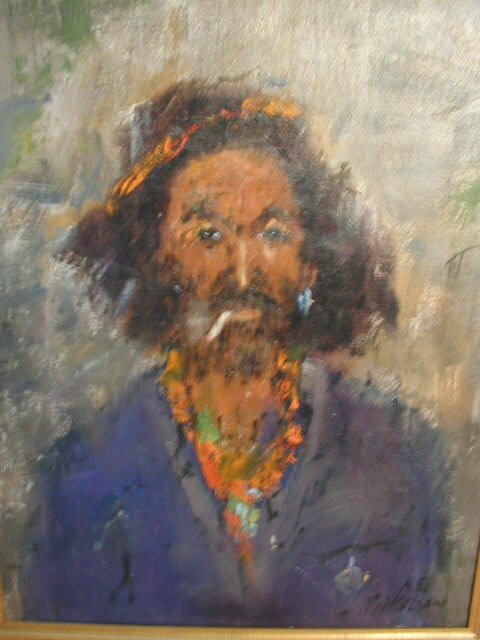 Christopher Michael aka Michael Lee Stevens– Born 1924, Artist/Poet and flamboyantly dressed figure. He was seen walking his small corgi dog around town. Tex– the guy with the cowboy hat, farmer overalls, riding a bike with a small dog in a handlebar basket all around town. I’m sure Tex was not his real name, but that is what us young kids called him as I recall. Do you know his name? Frank Dalton, aka Fran- Photographer of Newburyport Scenery. I own one of his prints of the Bartlet Mall. Richard Miller– 7 Nov 1946 – Jul 1987. Resident of the YMCA on State St who perished in a fire that destroyed the building in July of 1987. He was a large quiet figure who you would often see hanging in the downtown area. Leroy Lewis – Cop around town. He seemed to be liked by many and seemed to always be smiling while on the beat. Buzzy Lawler – Son of former Mayor George Lawler. He enjoyed talking to others over the CB radio during the late 70’s and early 80’s when it was cool too. His call name was Spider Man. You would see him around town a bit on his bike. -Kind and friendly character. This entry was posted on Friday, May 15th, 2009 and is filed under News, Notable People. You can follow any responses to this entry through the RSS 2.0 feed. You can leave a response, or trackback from your own site. wasn’t Franks/Frans girl friends name Marian? I think she was the sister of Ray Lyons owner of R&L packy on Storey Ave? She ran the info booth at the Bartlett Mall for years. She was very well dressed and loved bright orange nail polish, much like Fran. She was alot older then he was. The hermit was Jack Helphant or Halphant. I knew Frank/Fran and Chris Michael quite well as well as Fred Souther. Are you referring to the Fred Souther who bought a new burgandy Harly Sportster? You speak of them in the past tense…have they passed? I’ve been in the midwest for many years. And how about Tuck Cullen? I know he died but does anyone remember him? I am intrigued by the conversation here, sporadic as it may be, but am curious that no one has really brought up the artists that have called the port home (other than some brief comments about Frank Dalton), What about Jim Mickelson, or Jon Kodwyck? These chaps were well known and critically acclaimed in NBPT, and beyond. Hasn’t anyone ever seen Jim’s portrait of Duncan Chase in the Grog? Perhaps a better question would be, who hasn’t seen it? 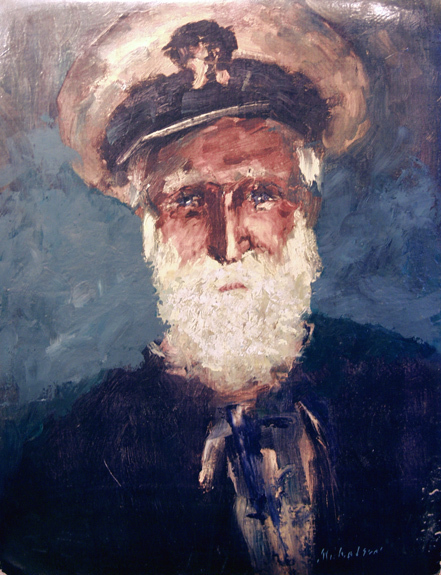 I have seen Duncan’s portrait hanging in the foyer of the Grog entrance about 10 years ago. I never knew who painted it though. If anyone can photograph it I think it would look really nice on this site! I would walk to R.A.Nock from my house on Pike Street, and I would go up State street everyday and chat with Richard. On my way home I would see him sitting in the curved brick stairwell/porch of the YMCA, we would talk at length about nothing that I can remember now. I remember specifically going home the day before it burned down and I honestly had a bad feeling. I remember waking up in the middle of the night, it was hot, so the windows were open and there were loud sirens and the air reeked. Somehow I knew it was very bad. The next day I saw the destroyed building, and I found out that Richard died…he was the only person that died. I recall it was from smoke inhalation, at least that’s what was in the Daily News I think. I was pissed and devastated, I had some friends at school, but he was a grown-up! I was depressed for weeks, crying at night, not understanding why; I remember my mom helping get over it by talking bout him, and treating him as though he really was my friend (which he was). I was always attracted to the “invisible” side of nbpt: the undeveloped far east end of the boardwalk; sneaking out back behind Starboard Galley, and hanging out on the docks back there; skulking around Old Burial Hill, and the Pierce Crypt (where the bodies had been bothered ( I remember the story of a corpse stuffed into a phone booth by Richdale’s, true? not true? ), and the lady that choked to death on a pea; sneaking into the Cupola at NHS. So naturally I came up with the awesome idea of sneaking into the now burnt-out YMCA. I can’t remember what I did inside, but I did get in and walked around. Not the brightest idea ever, but it did help me deal with loss of Richard. I remember when they destroyed the brick shell to make way for a small park. After he was gone, and the building was gone, I still remembered them both, I’m so glad some of you do too. Here’s another portrait of a notable character also done by Jim Mickelson…..not as famous as Duncan Chase….anybody know who this is? Could that last painting be Lee Stevens??? The portrait of the man in woman’s clothing may be Frank Dalton. Tex lived with my uncle Sheldon Lane in the south end for a while. After he died rumor has it that Tex stole some guns ! Sheldon had hundreds lol ! Does any one remember Sammie Howard? He was always in the parades and was an advocate for the March of Dimes? Does anyone remember the 3sisters that use to walk around together and pick up cig.butts off the sts.they lived at the n.end melvin is still living he is a cousin of marsha russell who is married to my ex larry russell is tommy russells brother.the police off.of nbpt. Saw Melvin walking around town a few yrs ago…remember my 1st job at Bergeson’s in the 70’s if you drew duty at the take out you also got the counter which meant your customers would be Melvin, Duncan, etc. I usually lost money on those shifts covering for them haha – Nbpt needs another Bergesons downtown. Leroy Lewis use to live in one of my parents apartments on Merrimac St. He lived there with his wife Pat at the time. I recall he lived underneath our apartment, and one day informed my mom about all the pot plants my brother Jeff had planted in her flower garden. She was weeding around them thinking they were flowers of some sort. She pulled them all out after he told her that there was a $250. fine for each one! Leroy later married Jeff Teagues mom. Melvin Russell is still a “ladies man” however he has calmed down on the pick up lines. I knew him when I was younger from State St. and now I know him better, I too have been working in the mental health field and had the opporitunity to hear his many stories about his past some funny some really sad. He still tries to pick up the ladies but certainly not in the manner he had in the past. Everyone used to think it was funny (some still do) when he would talk that way to girls which made him want to do that, he just wants people approval and friendship, he likes to make people happy. D. Brown was mentioned above, I knew him well, my family knew him well… I was named after one of his childrens mothers. I know a lot about his past, most of my life my father and mother were involved with him. My father of course wasn’t around much due to his involvement with D. Brown. D. Brown was around from the day I was born till he was put away and some time after his release years ago during his fight with cancer. There are so many stories I have in writting thanks to my grandmother about my childhood involving D. Brown and many other Newburyport, Amesbury, Salisbury and Rowley “characters”. I have the article “The Rise and Fall of Dennis Brown” from September 1990 and I was trying to find a way I could get another copy of it if that I possible because the one I have isnt in very good condition and its part of my past. If anyone knows of where I may be able to find one please let know. What about Madeline Lunt? She had a taxi cab and drove all around nbpt. She wore the same long dark green coat that looked like it was stuck to her skin. She looked like a man. She was so gross!!! Ray Clark – Ray certainly had problems but was a good guy and probably the most brilliant math genius I have ever known. He would wait until the one minute warning in math class and quickly write the answers down so Tod couldn’t copy. Had a perfect score on the ITT state math contest dispite arriving one hour late. Still rivers run deep. What he lacked in social skills he made up in math. He could do it all in his head. Today he would be described as suffering from Asbergers. I remember as a child in the 60s going to the public library with my mother there would usually be a group of “hippies” hanging out on the steps. I remember one of them had a nickname of “Brillo” as he had red hair in the shape of an affro….I never knew his real name or the name of the other guys. I remember my mother being a little afraid of them, but I was never afraid…they never bothered anyone and they were just having some laughs….I thought they were funny….lol. I often wonder if “Brillo” is still around and what his real name was? Also….does anyone remember a woman who used to eat raw hamburg in public (probably in the late 60s)? I was young at the time and I can remember seeing her in the downtown area….mostly around City Hall. I remember seeing her sitting on the steps of City Hall eating her raw hamburg. I never knew who she was. There was also another lady I used to call the “cat lady” as she owned many cats…..they finally made her get rid of them. She used to have a female friend as well…I remember seeing them at the shopping plaza and they were always verbally fighting….again, I do not know their names. The last I knew the “cat lady” lived was on the upper part of Kent St. I haven’t seen them in quite a few years, so I don’t know if either of them are still around. Now, this is going back..anyone old enough to remember Meho? How about Dummy Merritt? Dummy lived at the “poor farm” on North Atkinson St., couldn’t speak but was harmless. Maria – Brillo’s name was Billy Drouin. I can’t think of the other guys names at the moment. The hung around outside of Taffy’s late 60’s early 70’s. Someone was throwing out a lot of nicknames but didn’t include Lumpy. Lumpy was know by a lot of people in the area and grew up at the top of Carter St. Someone also named members of the Souther family and forgot Jimmy. Jenn – I remember when Leroy lived in the apartment at your house. I never heard about the pot plants that Jeff planted in your yard but my mother put what we had told her were African violets in her garden that ran along the side of our driveway. Leroy pulled in in the cruiser one day and was talking to her right next to that plant. I don’t think he ever noticed it but we got it out of there damn quick. Leroy was one of the “good” cops. I just happened onto this site today and have been reading it and enjoying it. Some of the names I knew but others no. I moved to NH in 60 so my ties were in other places, except when I went home to my parents home. Some one mentioned Earl Merritt, aka Dummy. He was the first one of the notables that I ever knew. He lived at the Horton Home, called the poor farm. My grandparents lived diagonally across from there on Low St. I don’t remember what her official title was but a friend of my grandmother, Maude Currier seemed to run it. I would visit her and there were only certain doors that I could use to go in. Lee Stevens was one that I remembered. We also had a lady that lived on Payson St that would be dressed in young girls clothes and would talk to herself as she walked. I can’t remember her name, but she had a kid a few years younger than I was. He was kind of odd also. Thanks all for the memories. It has been a fun couple of hours. Just got on this site and Loving all the names being put out here w many memories flowing with every name it is nice, to be back HOME!! Yes Larry Howard was running for mayor . A bunch of us would put out posters saying don’t be cheap vote for weep,and don’t be a coward vote for Larry Howard and he would rip them down we were just trying to help LOL. Just found this site and it took me down memory lane. I was born in Newburyport and lived there many years in the north end. I know almost all these names and what a great place to have grown up in. Lots of great memories was made there with a lot of great kids. I went to Brown, Jackman, and High school school there. The worst memory was when Terrance Connors drowned does anyone remember this. I think it was 1969 or 1970. Richard Miller was a neighbor of mine as well as lee Stevens. Lee Stevens mother Betty and my grandmother knew each other. Thanks to all the post this has been very enjoyable. I forgot to mention that when I was a young girl I would make mud pies for Leroy Lewis as he walked his beat up Kent Street . He was a great cop! I actually lived on both ends of Newburyport growing up. I went to school with Ray Clark from 6th – 12th grades. No social skills, but you could tell he wanted to be liked. I agree that he probably had (has?) Aspergers. I remember Meho on the downtown streets, but very little about him. He was probably nice, but I was a little scared of him. I wonder if his nickname was from the Spanish for “my son” (Mi hijo). A lot of people here in Texas where I live call their boys what sounds like Meho phonetically. Read many comments re Madeline Lunt and her taxi business. When I was young, she lived on Woodland St. with her parents. (Her father owned a jewelry store at one time). She became ill and afterwards was unable to continue her chosen career. During the depression, she established her taxi business and was always dependable. She met every train, regardless of the weather. No, her clothes were not haute coutoure, but she was neat and clean. I do not recall her having many cats either and doubt if she had a lot of money. Madeline minded her own business and was not a person for a lot of “small talk”. I grew up in Nbpt. and my comments are from my own personal observation. Looking for Frank Dalton’s photographs. In particular a photo he took of me about 35 years ago. It was a young teenage boy without a shirt in a tom sawyer like hat. It was sold by Another Atmosphere’s in Newburyport. I do remember Miho. I think he lived on Broad St and I lived on Oakland St. I remember Larry Howard too, but I always felt so sorry for him so whenever I would see him I would tell him hi. More on Earle Merritt: Earle was my great-grandfather’s cousin, so I’ve researched his family as part of my family tree. Earle Mowatt Merritt was the youngest of 9 children born to Manasseh and Rebecca (Swain) Merritt, in 1895, at which point Rebecca was 40. By 1911, Earle’s older siblings appear to have all died (I’m only missing the date of death for 1 brother, but if he survived, it was somewhere else), and as all of the other male Merritts related to them had either died or moved away, Manasseh and Earle were the last Merritt males left in Newburyport, out of two related Merritt families that had arrived in Newburyport from Nova Scotia in the late 1840s and early 1850s. When a World War I draft card needed to be filled out for Earle in 1917, it listed him as deaf and dumb, and he signed with an X, indicating he was likely illiterate, too. After Manasseh died in 1926 and Rebecca in 1929, Earle was then the only Merritt living in the city as recorded by the 1930 census, and was already living at the Horton home run by the Curriers, and was also there in the 1940 census, and when a WWII Draft Card needed to be filled out for him it was signed by Maude Currier on his behalf. Earle died in Danvers in 1969, and is buried there. I expect he was transferred to the mental hospital there, but have no proof of that. River. Where his pal Jacky Flynn met his maker after falling or being ‘pushed’ into those dark, swirling waters. Wondering if the artist is still amongst us? This is in response to #29 by Rick Meyers. Thank you for your response! I am familiar with Madeline Lunt and I know she had cats as well. There was another lady in town who had a lot of cats as well….and a friend, and they always seem to be verbally fighting wherever they went. I found out a little while ago that her name may have been Laura??? I wonder if anyone knew her full name and maybe that of her friend?